An act for "enrolling and calling out the National Forces" was signed into law on March 3, 1863, by President Abraham Lincoln. This, the first effective draft by the federal government, called for all men between the ages of 18 and 45 to be enrolled into local militia units and be available to be called into national service. The draft law exempted men in some occupations, such as telegraph operators, railroad engineers, judges, and certain other government employees. Men with mental disabilities or with certain types of dependents were also exempted. Physical disabilities that would exempt a man included imperfect vision in the right eye, lack of front teeth and molars, and loss of more than one finger of the right hand or more than two fingers of the left hand. The actual drafting of the men was the responsibility of the states, which usually used a lottery system. When the government issued a call for more troops, each state would be given a quota to fill based on its population. The number of volunteers would be subtracted from the quota and the difference would be drafted. If a draftee, volunteered before the final muster, he avoided the stigma of compulsory service and was eligible to collect a bounty of $100 from the federal government plus additional bounties from the state and local communities. 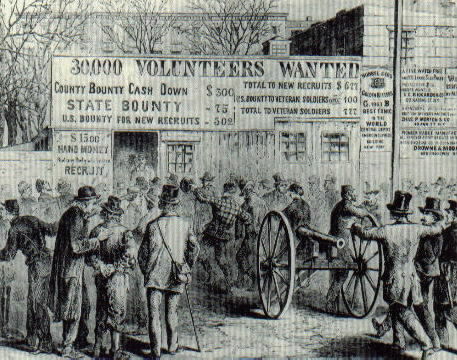 In total, the bounties could exceed $500, which was about the average yearly wage in those days. States considered it a matter of pride to fill their quotas without having to resort to the draft. A draftee could gain an exemption by paying a fee of $300 or by hiring a substitute. The obvious inequity of this provision prompted the cry of "rich man's war, but poor man's fight." The bounty system also made possible the enrichment of a large number of unscrupulous persons called "bounty jumpers." These men would enlist to collect their bounty, then desert and enlist somewhere else and collect another bounty.